Late one fall morning, Bob and I decided to pack an impromptu picnic and head down to Rosetta McClain Gardens on the Scarborough Bluffs here in Toronto. 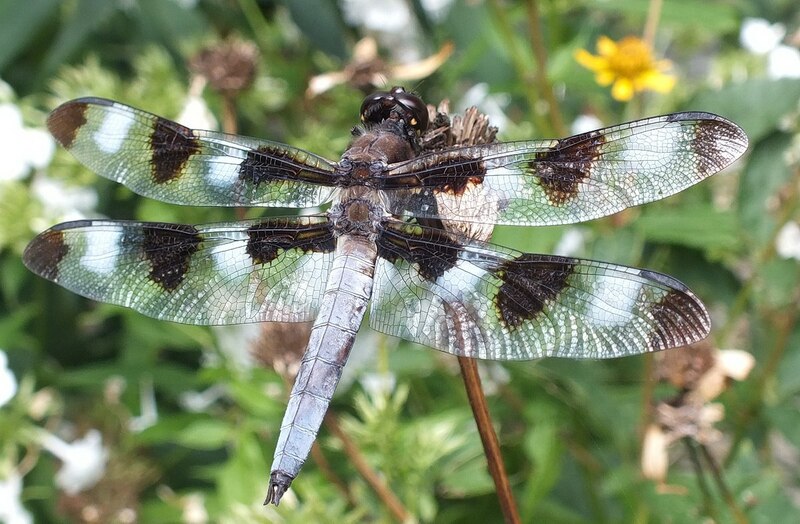 We anticipated wonderful views of Lake Ontario as we munched on our modest lunch, but we did not foresee the multitudes of dragonflies that had gathered at the gardens, ones such as this Twelve-spotted Skimmer Dragonfly (Libellula pulchella). 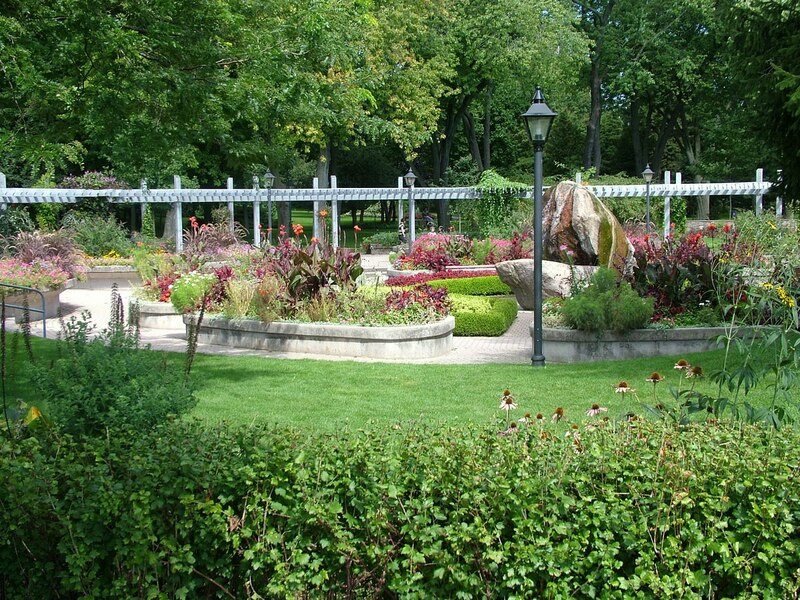 It was a magnificently sunny day, perfect for taking in the expansive flower gardens and warm temperatures. We ran into, and engaged in animated conversation, fellow birders and other keen photographers intent on catching up with some of the dragonflies. 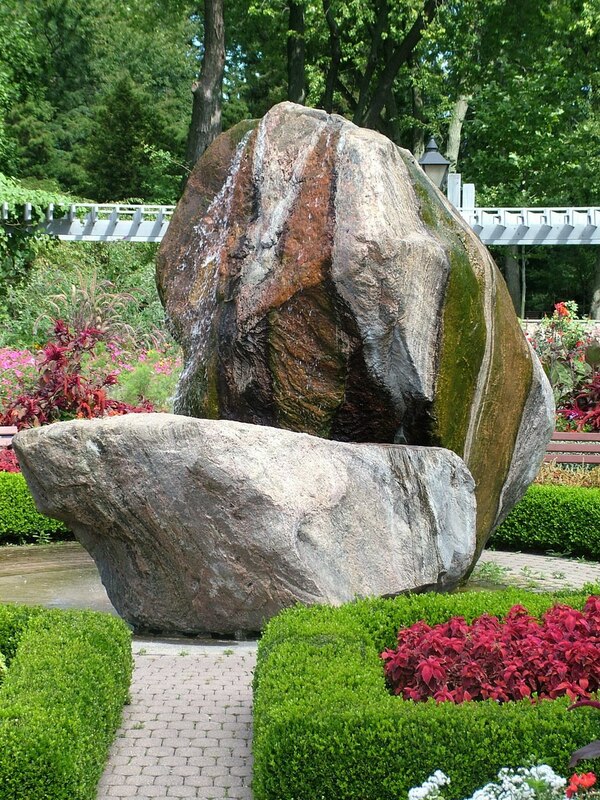 Rosetta McClain Gardens features a humongous boulder that has been fashioned into a water fountain, as well as arbours clad in trailing flowers and vines, rose gardens, and the remains of the heritage home that belonged to the original owners of the property. 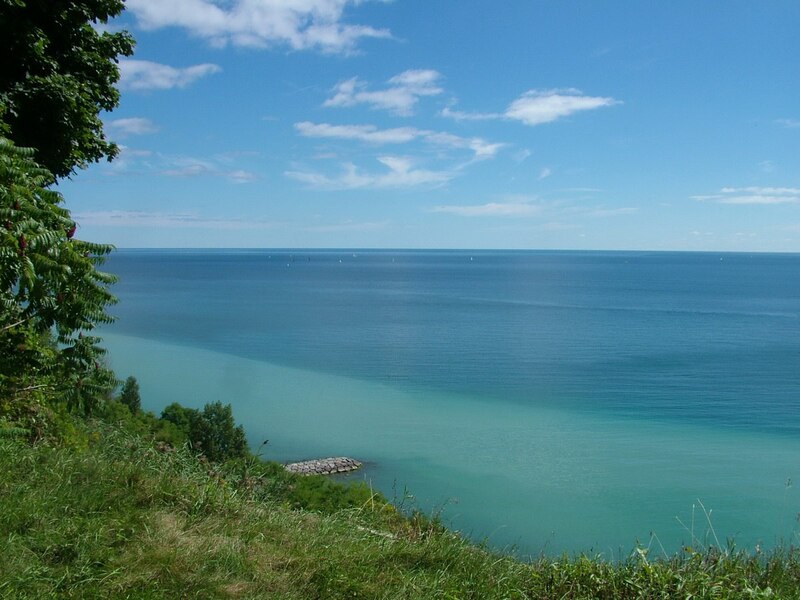 It just so happens that the location of Rosetta McClain Gardens makes it a stopover for birds and insects before they continue on their migration south across Lake Ontario. 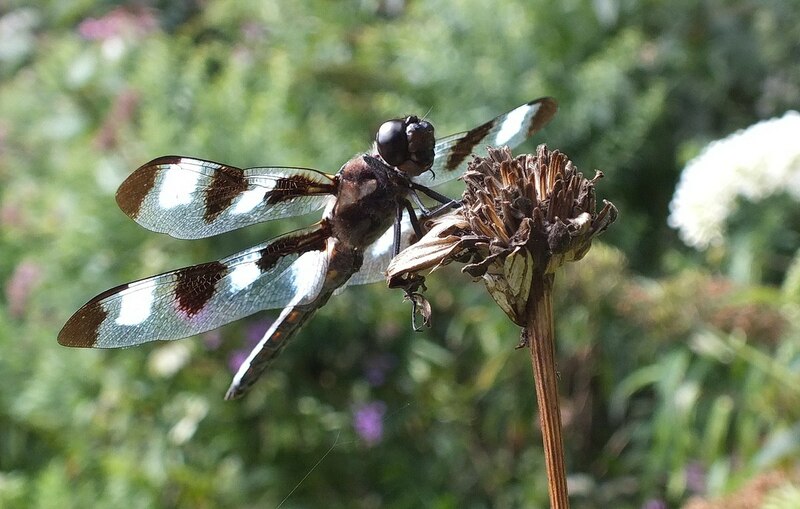 It was in the vicinity of the Rose Garden that Bob and I were delighted to find a Twelve-spotted Skimmer Dragonfly at rest on a dried flower head. We were lucky to catch one in a stationary position because most of those frequenting the park seemed to be flitting about in pursuit of insects. 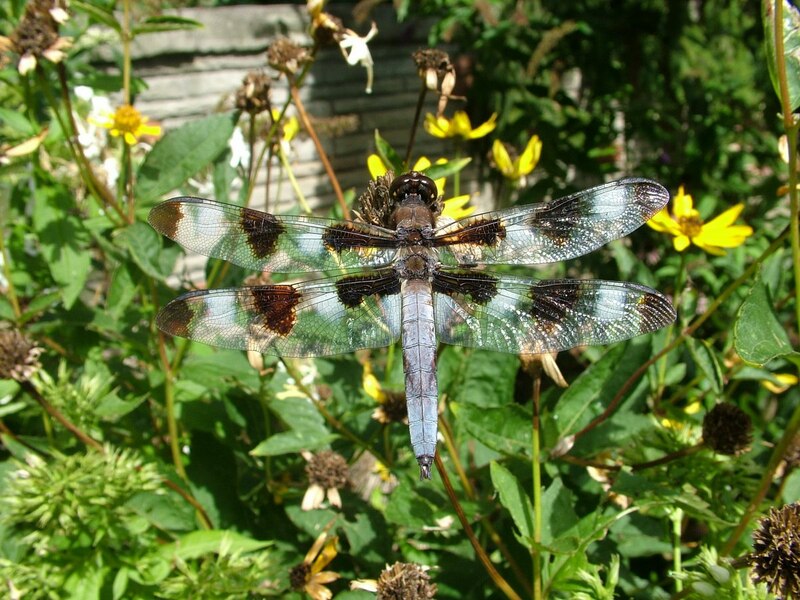 These dragonflies are quite large with a body about 2 inches long and a wingspan of about 3 inches. In this profile shot, you can just see the dragonfly’s tongue at the bottom of its head. I wondered if this dragonfly was chilly because it had its body strategically facing the sun to maximize exposure. 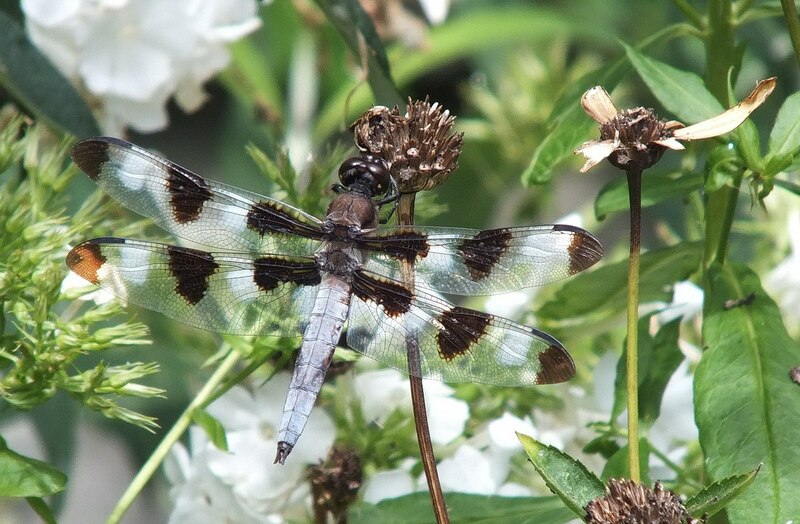 Twelve-spotted Skimmer Dragonflies have also been referred to as Ten-spotted Dragonflies or Ten-spot Skimmers, which is referring to the 8 white spots on the wings plus the 2 white spots at the base of the rear wings. This designation, however, only covers the adult male dragonflies, which develop the white spots over time. Females are lacking the white spots. While scanning the surrounding area for any butterflies that might be attracted to the butterfly bushes, Bob’s eye was drawn to a flash of red that contrasted with the vibrant green leaves of another plant. 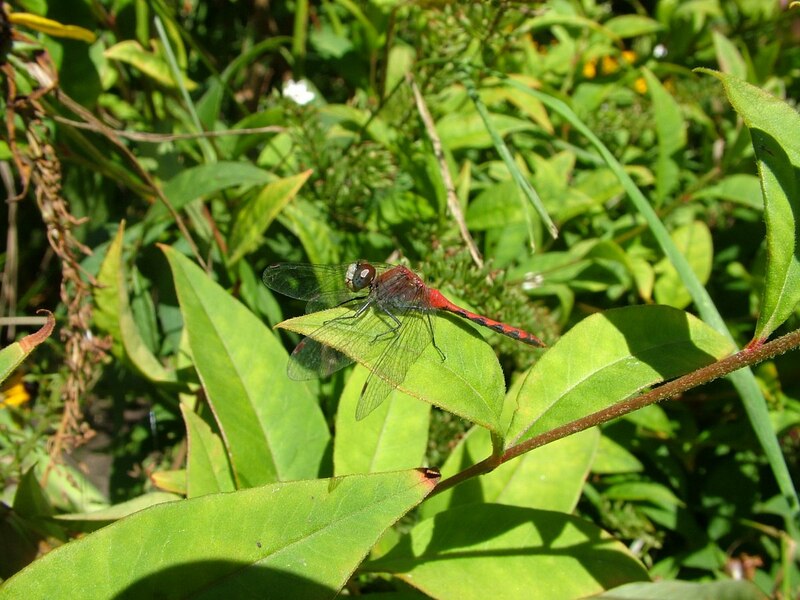 This smaller dragonfly is a White-faced Meadowhawk (Sympetrum obturusum). By aligning its abdomen relative to the sun, it is able to regulate its body temperature. This dragonfly is an adult male, identifiable by the yellowish-white face. 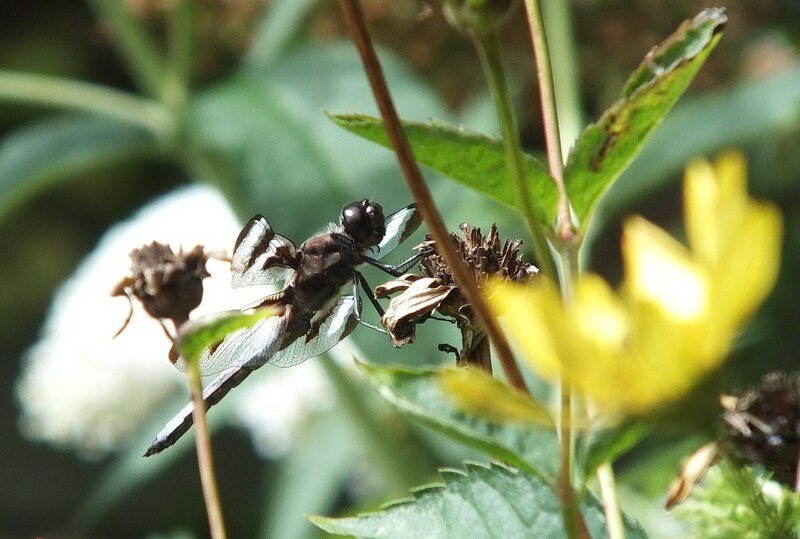 These are smaller dragonflies with a body length of between 1-2 inches long. 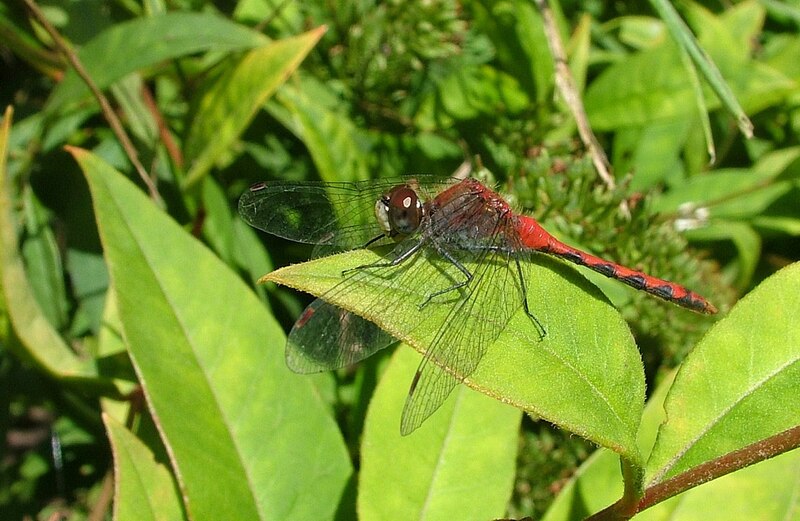 The shiny red abdomen is marked with black triangles along each side, and the wings are clear except for a smudge of yellowish-brown where they attach to the body. 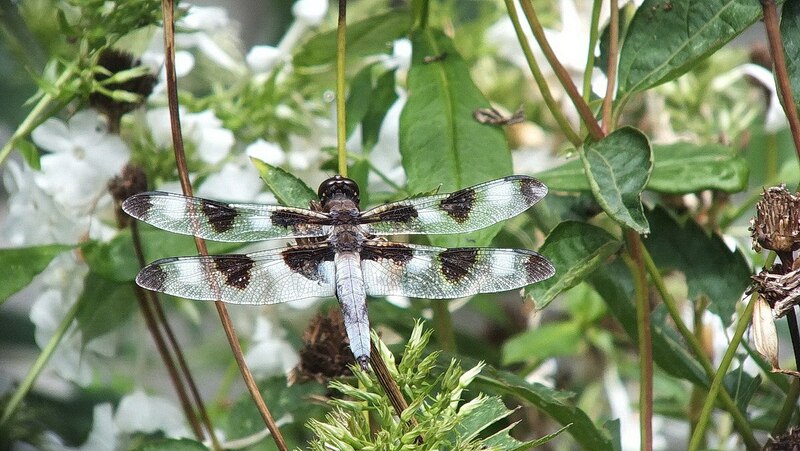 When we refocused our attention on the Twelve-spotted Skimmer Dragonfly , I reminded Bob that we are lucky for so many of these dragonflies in our area. As adults, they have a voracious appetite for mosquitoes, and as aquatic dragonfly larvae, they whip around a pond gobbling up mosquito larvae and pupae. What an added bonus! Male Twelve-spot Skimmers typically fly, stop and hover, then make off in a different direction. They are known for patrolling a territory, defending it against other dragonflies including other males of their own species, and will return time and again to the same sentinel post. Perhaps this dragonfly just needed a rest. We were lucky that it had decided to stay put for such a long period of time.